Originally shared on my first blog site. One of the biggest corporate creeps are the power company’s. They want you to think they are the only source of power in the world. The Occupy Flint Camp was 100% solar power. Take some old solar powered yard lights to make your own lighting system and, tell the power companies to go jump in the lake! LOL. 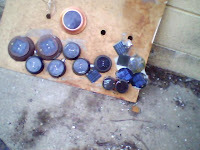 The first trick is to dismantle the solar cells from the light & battery base. Opening the package is a simple matter of removing 2 to 4 small screws. you MUST use caution when opening the case because there are wires that run from the cell itself to the bottom half of the compartment that you will need to remain connected to the cell, otherwise you will need a soldering iron. I have 3 solar cells for every AA battery connected so the voltage and amperage is doubled. When Wired one way (parallel) you get more amps, and the other (series) gives more volts. You will need three times as many cells as lights. The purpose for having 3 cells for every battery is when you have low sun light, you can still get a good charge for the day. There doesn’t seem to be a need to worry about over charging since the batteries and/or the circuits seems to take care of it. Increasing the amps or volts too much may over charge the batteries, and since I’ve already tested the 3 to 1, why not stay with it unless you would like to experiment with the cells to the point of charging a car/marine battery. That was my original goal, but was not able to get a amp meter to read it. It varies from one brand to another as to the color of the wire, and some may have 3 or 4 wires. You must determine which wires are correct before cutting them, and they must be cut in the in the maximum length,because you want to leave as much extra wire as possible. keeping most of the wire on the cell itself. Not having a soldering iron to secure each of the attached wires can cause a mistake, and will cause the cell to be usefulness. You need to keep as much of the power wire attached to the solar cells as possible. Any piece of plywood, or even wall paneling will work to mount the cells to. I drilled a few holes into compressed fiber board to feed the power wires through. It is suggested that you hot glue the cells to the panel to keep them in place. Then it’s just a simple matter of wiring the cells in the above configuration. Now that the panel is assembled, let’s move on to the lights. The two wires from the panel must be connected to the battery terminals in parallel, of course positive to positive and negative to negative. Now you should be getting a light without the battery in the socket as long as the panel is placed in the sun. Sometimes there are 2 or four to turn the light on and off. If the light is a 4 wire system, then its just a matter of connecting a switch between the wires, but if its a 3 wire then connecting the ground (negative) power and the 3rd line to a switch allows you to turn the power on or off. Just a little side note. 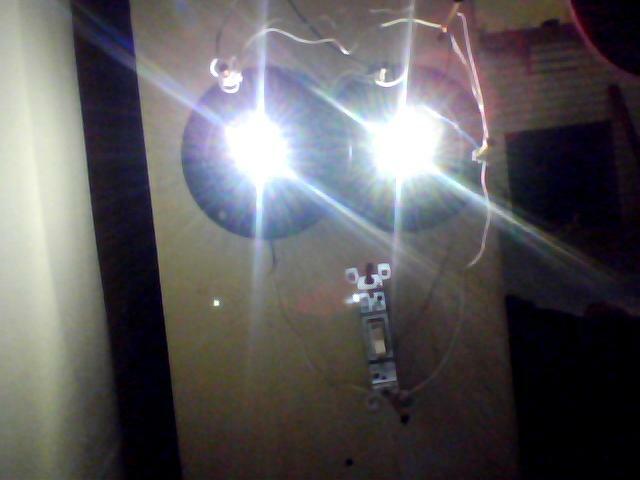 I assembled this with out spending one penny but having a hot glue gun to mount the cells and a soldering iron to fix broken wires and make a better connection would help. Oh yes. Life is full of surprises. I hope she will get past that one with time. Your website is terribly informative and your articles are wonderful.I’ll be back to read your other article, thank you very much. Hi there, I found your site by the use of Google while looking for a similar subject, your web site got here up, it seems good. I have bookmarked it in my google bookmarks.